Entries categorized "The Crupi Report"
A colleague sent a link to a piece on Bacon's Rebellion about Richmond being cited as demonstrating evidence of becoming a World City, which got me thinking in about six different directions. One of which was what exactly the evidence was. Sadly, it was Richmond's status as a minor global legal services center. Although that's nothing to sneeze at, it's a shame it didn't have more to do with the region's burgeoning reputation as a cultural mecca, or our downtown dining scene, or the explosion of weblogs. Having said that, the fact that Richmond continues to land on lists -- World Cities, regions dodging the economic collapse, best place for business and careers, etc. -- suggests to me that the Richmond region remains that kid in high school who still can't see that she's becoming an attractive young woman. Maybe there should be another list for cities suffering from the Ugly Duckling Syndrome. "It's kind of in limbo," said Gregory H. Wingfield, president of the Greater Richmond Partnership, a regional economic-development agency. "We got overwhelmed by the economy and some leadership challenges." In April, the Greater Richmond Chamber formed the Capital Region Collaborative to come up with a plan for the future. In May, the Richmond Regional Planning District Commission joined with the chamber to lead those efforts. Business and government were on the same team with similar goals of planning for the region. Then people began retiring, stepping down or starting positions anew. The failing economy also offered up plenty of distractions. "The cynics of the world would slam people for not doing anything," Crupi said yesterday from his Texas office. "I'm not sure that's fair in this case." The Chamber's longtime president, Jim Dunn, an advocate for the Crupi report, retired. A new president and chair of the Chamber's board transitioned into office over the summer. The new executive director of the planning district commission was hired. The co-chair of the group formed to move Crupi's recommendations forward ran for mayor. Robert J. Grey Jr., a partner at the law firm Hunton & Williams who was chosen to lead the collaborative, decided to run for mayor of Richmond. "It certainly was one of the things that caused us to take a step back and consider what we were going to do and how to move forward with it," said Kim Scheeler, a former chamber executive in Tampa, Fla., who took over Dunn's spot at the chamber in August. Another newcomer, Robert Crum, started as executive director of the planning district commission in September after a lengthy search. "A lot of circumstances have changed since we first started thinking about a post-Crupi plan," Grey said. "We've had elections, we've had a change in economic conditions, we've had new leadership. The world has basically changed." ...Scheeler and Crum now are talking to figure out how to proceed. "We're the guys supposed to be driving this, and we're not sure where we're supposed to be going," Scheeler said. "I want to make sure we get it right." I had a long piece nearly written in which I danced around the virtual room dressed only in words that sang Michael Paul Williams' praises -- in general for his always smart, usually spot-on advocacy for a different Richmond; and specifically for his latest column that essentially calls Richmond out for being all hat and no cattle when it comes to actively creating a healthy and dynamic region. But since I'm involved in the currently stalled Capital Region Collaborative, which is intended to do something with the report issued one year ago this month to Richmond's corporate leaders by strategic consultant Jim Crupi, I felt I should virtually crumble it up. So, go read Williams' column and practice hearing my voice saying, "Amen." I was so happy last week to see someone smarter than me acknowledge the small, inherent flaw in last fall's report delivered to the Greater Richmond Chamber of Commerce by strategic consultant Jim Crupi. It happened quietly in a Back Page commentary by a University of Richmond leadership studies professor, Thad Williamson. Consultant Jim Crupi offered a harsh critique of the culture of leadership in Richmond in its shortsightedness, inability to capitalize on existing strengths, insularity, unwillingness to innovate, and so forth. But then he turned around and offered a set of proposals and recommendations predicated on a model of a business-led change. The expectation apparently was that by virtue of reading the report, the business community might suddenly become something it never has been: a model of innovative, progressive, farsighted leadership. But Williamson's target was larger than Crupi, whose report incidentally has triggered a new (and long-overdue) series of conversations about the nature of power, influence, vision, strategy and diversity in our community. Williamson's commentary addresses -- in a rather compelling fashion -- the absence of civic power in our community. It's probably time for Richmonders to stop waiting for those with power to exercise it. Truth is, you and I have just as much control over our future as the business community -- on a good day, we probably have more. It will also help if Richmond’s future leaders (the incredibly talented and relatively marginalized leaders of the area’s non-profit and community-centered organizations; young artists and small business owners; and emerging media talent) stop waiting for someone else — Jim Crupi, Jim Ukrop or Gene Trani — to give us our leadership. In other words, those on the margins can wait for an invitation, or they can issue their own invitations. Either way, it’s time for the conversation to change — and the best way to do that is to invite new people into the conversation, and to ask different questions. Patriarchy. Power Lists. Who's your daddy? Instead of simply asking who has the most influence in this town, we can instead ask: Does this collection of actors have the capacity to move the city toward important goals that advance the public interest? Those goals might include improving public schools, working to eliminate poverty, creating a government that is responsive and responsible to citizens, or improving the livability and attractiveness of the city. A strong case can be made is that the answer to that question, to date, must be “no,” particularly with respect to public schools and poverty. Many people recognize those issues as critical, but what has been done and what is being done simply are not sufficient to alter the fundamental realities and long-term trends. Looking at power in this second sense thus leads us to a perhaps startling conclusion: Perhaps all the esteemed powerful people on Style’s list aren’t so powerful after all. They don’t have the capacity to help Richmond address its most fundamental and obvious problems; hence they are powerless. Recognizing that powerlessness is important. It is important because for too long -- even today -- the Richmond region has turned to a handful of politicians and businesspeople to transform the region. And it is important because while those people can and should be partners in all of our efforts to lift up our community, the citizens of the City of Richmond and the Richmond region are, and always have been, the other side of the equation. Waiting for the world to change hasn't helped. Maybe it's time to just change the world. When strategic consultant Jim Crupi issued his second report on the Richmond region last November, he noted that the Richmond community was pretty good at talking and planning. Crupi also pointed out that when it came to a strong, compelling regional vision the region was asleep at the wheel. And speaking of asleep, Crupi pointed out that not only was the collective regional leadership getting older, but that there was virtually no bench of young community leaders waiting in the wings. None that Crupi saw, anyway. A group of area government and business leaders is announcing today the names of people it thinks can shape a bold idea: creating a vision for central Virginia that might actually be put in place. After years of studies, plans and publicly floated initiatives, the two sources of many of those ideas joined forces in May to create the Capital Region Collaborative. The group includes members from the government-based Richmond Regional Planning District Commission and the business-led Greater Richmond Chamber. The CRC today is naming the members of its first advisory team. The eight government and six business leaders will ultimately be joined by 40 or so others on a team charged with shaping a workable vision for the area's future. And now for a moment of transparency -- when I am not gnashing my teeth as a member of Richmond's civic-minded weblog community, I am apparently a business leader. In my role as Leadership Development Team Leader at Luck Stone, where I work with a group of folks focused on championing our business culture and core values among 1,000 employees, I have been named to the Capital Region Collaborative's advisory team. A few years ago, one of my mentors told me that I needed to "choose between being a committed corporate player and an avant-garde freelance consultant." First, I ignored his advice. Then I tried to alternate between the two. Finally, I realized that what I really needed to be was myself -- which is a little of both simultaneously. In the coming weeks and months, I'll be active in trying to bring a different perspective to the CRC -- and in trying to bring more diverse and unique voices to a conversation about Richmond's future. Talking and planning are important components of good visioning work. So is action. Having decision-makers at the table is important. Diversity and inclusion are important, too. I hope to bring new ideas, and a challenging perspective on what it means to create a shared vision for a region as diverse as Central Virginia. It's going to be an interesting ride. I'm pretty sure you guys will let me know if I screw it up. On the heels of a highly successful, collaborative process to develop a new Downtown Plan for Richmond and the highly critical report on the Richmond region's ability to work together for a shared vision, there are more opportunities for different conversations that engage our broader community around a new future. Over at Smart Communities, Suzanne Morse points us to the work of one community -- Cedar Rapids, Iowa. 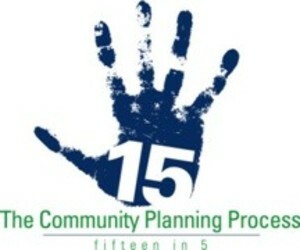 What I particularly like about Cedar Rapids' Fifteen in Five initiative is that it addresses one of the most fundamental issues that a broad spectrum of any community ought to be discussing -- what kind of place do we want our community to be? This type of discussion is similar to the conversations generated by Richmond's Downtown Plan process, but go beyond the planning aspect to chase aspirations. Cedar Rapids not only decided it wanted to pursue light rail, it wants to launch a best-in-the-nation early childhood eduction program. As the Chamber of Commerce-initiated Capital Region Collaborative takes shape, I wonder if they will take the typical Richmond approach -- develop initiatives based on what those at the table already know -- or if the new organization will lead with a sense of genuine curiosity and help the Richmond region's residents craft a vision for tomorrow. New Partnership, Same Conversation? Let's Hope Not. It's nice to see Don Harrison pull his head out of whatever he does for a living long enough to post on some recent developments at Save Richmond. His posts usually set me to thinking about the incredibly dysfunctional power relationships in the Richmond region -- between the private and public sectors, between politicians and the communities they represent, between for-profit and not-for-profit organizations. Most of the dysfunction is rooted in the past, rooted in habit and not easily changed. But the disconnect in these relationships is high on the list of those things that are not only holding us back as a region, but is also what continues to eat away at what passes for civic health -- not only in the greater Richmond region, but within our neighborhood communities. At the heart of all of these relationships is the nature of citizenship -- what it means for individuals and organizations within a community to actively hold, believe or support something larger (even slightly larger) than their own interests. This is something that sat at the center of a workshop I attended last fall with community advocate Peter Block. True accountability hinges on the choice to care for the whole thing, Block said. I've sat in plenty of private meetings with regional players -- politicians, business people and residents -- where there was an active desire to care for the whole thing, and to speak passionately about the city, the region, the school system, the James River, the issue of affordable housing, you name it. But something happens when people move from private conversation into the public space. And Block spoke to that, as well -- What kills the future isn't opposition, it's lip service. All of this leads me to an emerging organization in the region called the Capital Region Collaborative, which I spoke to the Greater Richmond Chamber of Commerce's Jim Dunn about back in April. In recent weeks, more information has been revealed about the collaborative, and Don Harrison at Save Richmond recently asked some relevant questions and concerns about the new regional group. Save Richmond sees shades of Mayor Wilder's Performing Arts Committee in the creation of this new group, especially since attorney Robert Grey will be leading the new collaborative -- and chaired the mayor's incredibly secretive arts committee. But Harrison's key point is how he ends his post -- whether or not the Capital Region Collaborative will lead the region down a new path. Lacking details, it's a tough call. Certainly, I believe the intentions of the key players behind the CRC and have discussed the new organization with a few of them. Unlike some on the sidelines, I don't see the politics and power struggles in the region as being a matter of good versus evil -- in most cases, people are driven by what they know and what they want. What I do see is that even the good intentions behind the CRC run the risk of being co-opted by old habits. In its efforts to avoid "jumping off the cliff," as Dunn puts it, the organizers behind the CRC are setting an early tone for the organization of a top-down, consensus-driven body. Lots of preliminary planning meetings coupled with dog-and-pony shows to invite regional leaders to get on board with the new organization builds on one of the worst habits exhibited by Richmond's leaders over the years -- the sense that buy-in trumps vision, transparency and discussion. If I were masterminding an organization like the CRC, one of the first things I would do would be to issue an invitation to area businesses, community and civic groups, non-profits and elected officials to a series of conversations about creating a shared future. Again, I turn to Block -- The only ethical use of power is the leader as a host, a convener, one who invites others ... knowing that your job as a leader is to help bring the gifts of those on the margins to the center. For too long, regional conversations have limited the gifts of those on the margins. That the reason for this is primarily that those leading the conversations don't believe that those on the margins have an interest in being engaged goes a long way toward explaining why our progress as a community remains fragmented. In November, strategic consultant Jim Crupi returned to Richmond after a 15-year hiatus and informed the local business community that while Richmond still had many of the right pieces in place, it remained a half-baked city. So to speak. Crupi's second report -- "Putting the Future Together" -- essentially tagged Richmond for its continued inability to maintain a consistent regional focus; for an emphasis on tactical projects rather than strategic visions; and a lack of continuity in its regional leadership. Earlier in April, I reported that the Chamber of Commerce was working to stand up a new organization -- with new faces -- to help tackle some of the opportunities laid out by Crupi, and to help move the region forward more effectively in other areas. The Greater Richmond Chamber named champions yesterday to oversee how the agency and community move forward in the wake of the Crupi report. Issued in November, the report is a 55-page examination of issues in the Richmond area. Robert J. Grey Jr. will lead the startup phase of the effort. He is a partner specializing in regulated industries and government relations for Hunton & Williams LLP. Grey could not be reached for comment. William C. Bosher Jr., executive director of the Commonwealth Educational Policy Institute, will facilitate the process. Bosher said the chamber hopes to talk with key players in the community to come up with ideas that could become part of a plan. Young people, who will inherit the vision, will be involved to ensure there is ownership, Bosher said. "This is much bigger potentially than the Crupi report because the Crupi report will be used as one of our sources of data," Bosher said. Times-Dispatch: Could the two of you walk us through your thoughts on the findings of James Crupi's report card for Central Virginia? VCU President Eugene Trani: The Crupi Report was a very good idea. The process was handled right, in contrast to Crupi's report processed in the 1990s. This was an open report -- many people were interviewed. The results were formally presented to the Richmond community, and the Greater Richmond Chamber is taking ownership for the next steps in the process . . . . There is one thing I don't think is in the Crupi Report anywhere. This is my fourth state-capital, large university: Columbus, Ohio -- Ohio State University; Lincoln, Neb. -- the University of Nebraska; and Madison, Wis. -- the University of Wisconsin System, where I was before I came to Richmond. This is the commonwealth's only capital. That idea is not dealt with at all in the Crupi Report. I believe every member of the legislature ought to have two obligations: (1) to their own constituents, and (2) to Virginia's capital in its broadest sense. So what role should the state properly play in regard to the recommendations of the Crupi Report? How are we going to make sure the state capital is one that everyone can be proud of? Just as one example: the convention center. Everybody wants to go to Lincoln or Madison and Columbus from all across Ohio, Nebraska, and Wisconsin. The same thing ought to be the case with state conventions . . . .[Virginia organizations] ought to be coming to Richmond to really enjoy their capital with its newly redone Capital grounds, and enjoying the attractions. Times-Dispatch: You've been in four other capital regions. Is Central Virginia behind the other capital regions you mentioned? Trani: They work together as capital areas . . . .Clearly regionalism is an important issue. Secondly, full economic participation in the prosperity of the area is a very important thing . . . .Whatever happens in the capital region has to be done so that large groups of people are not left behind. And the third area: . . . We all must come together to work with [Richmond's] superintendent, to work with the School Board, to work with the school leadership in individual buildings to make sure the product of the Richmond City Schools, which Crupi specifically talks about, can move easily to Virginia Commonwealth University and J. Sargeant Reynolds Community College to study, first of all -- and then into jobs over at Phillip Morris or Dominion or wherever.